A protocol for enhancing carbohydrate ion signals in MALDI mass spectrometry by reforming crystalline structures during sample preparation processes is demonstrated. Ou, Y. M., Kuo, S. Y., Lee, H., Chang, H. T., Wang, Y. S. An Efficient Sample Preparation Method to Enhance Carbohydrate Ion Signals in Matrix-assisted Laser Desorption/Ionization Mass Spectrometry. J. Vis. Exp. (137), e57660, doi:10.3791/57660 (2018). Sample preparation is a critical process in mass spectrometry (MS) analysis of carbohydrates. Although matrix-assisted laser desorption/ionization (MALDI) MS is the method of choice in carbohydrate analysis, poor ion signal and data reproducibility of carbohydrate samples continue to be severe problems. For quantitative analysis of carbohydrates, an effective analytical protocol providing superior data quality is necessary. This video demonstrates sample preparation protocols to improve signal intensity and minimize data variation of carbohydrates in MALDI-MS. After drying and crystallization of sample droplets, the crystal morphology is reformed by methanol before mass spectrometric analysis. The enhancement in carbohydrate signal is examined with MALDI imaging mass spectrometry (IMS). Experimental results show that crystal reformation adjusts crystalline structures and redistributes carbohydrate analytes. 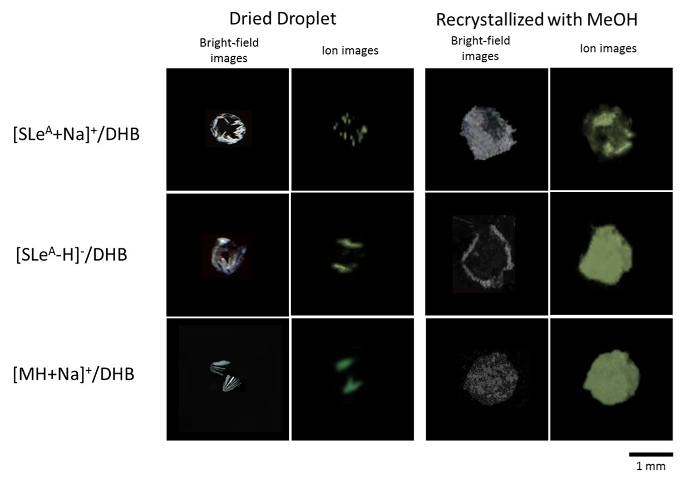 In comparison with the dried droplet preparation method in conventional MALDI-MS, reforming carbohydrate crystal morphologies with methanol shows significantly better signal intensity, ion image distribution, and data stability. Since the protocols demonstrated herein do not involve changes in sample composition, they are generally applicable to various carbohydrates and matrixes. Carbohydrate analysis is an important and challenging subject. Carbohydrates and their derivatives play important roles in living organisms1,2,3. These molecules have complicated structures and are prone to decompose. Many of them cannot be clearly characterized due to difficulties in separation and detection. Although matrix-assisted laser desorption/ionization (MALDI) mass spectrometry (MS) has been applied to analysis of a wide range of biomolecules, due to its sensitivity and comprehensible results4, analyzing carbohydrates using MALDI-MS continues to be a major challenge due to the low ionization efficiency of such molecules5. Chemical derivatization is a common way to improve ionization efficiency of carbohydrates6,7, but such procedures are time and sample consuming. Besides, the ionization efficiency of derivatized carbohydrates is still lower than that of proteins. Thus, the development of methods to improve carbohydrate signal in MALDI-MS without complicated procedures is necessary. The application of MALDI-MS to quantitative analysis is another challenging subject. A major problem of MALDI-MS is that its sensitivity and data reproducibility relies critically on sample preparation protocols and experimental parameters. In many cases, quantitative analysis by MALDI-MS is unreliable due to heterogeneous sample morphologies and analyte distribution. A well-known example is samples prepared with a 2,5-dihydroxybenzoic acid (DHB) MALDI matrix. When DHB is crystallized slowly under ambient environment, the extent of analyte incorporation into matrix crystals is unpredictable, because resultant samples show irregular morphologies. Such samples normally consist of large needle-shaped and fine crystals. When DHB is prepared using a volatile solvent and/or a heated sample plate, a fast drying process results in more homogeneous fine crystals and better quantitative results8,9,10. This technique is known as "recrystallization" of MALDI samples. The improvement is attributed to better incorporation of analytes into fine matrix crystals during the fast crystallization process. We have also demonstrated that adjusting the sample preparation environment reduced the heterogeneity of carbohydrate signal and improved quantitative results11,12. The findings in these works suggest that sample morphology is a critical factor in determining carbohydrate signal quality. To develop a general strategy for daily analysis, an efficient sample reformation method providing improved carbohydrate sensitivity is required. We have systematically examined the correlation between sample morphology and carbohydrate sensitivity in MALDI-MS in a recent report13. The results obtained using several important carbohydrates and matrixes show that the best signal enhancement is fulfilled by recrystallizing dried MALDI samples. The morphology of samples prepared using the conventional dried droplet (DD) method is reformed by fast recrystallization with methanol (MeOH). The detailed sample preparation protocols are demonstrated here. The protocol consists of three main steps, including sample plate preconditioning, sample deposition and recrystallization, and mass spectrometry analysis. The utilized carbohydrates include sialyl-lewis A (SLeA) and maltoheptaose (MH). DHB is used as a model matrix. The results show that carbohydrate signal intensity and spatial distribution improved markedly after recrystallization. Such a method can be applied to samples with other popular matrixes, including 2,4,6-trihydroxyacetophenone (THAP) and α-cyano-4-hydroxycinnamic acid. This method serves as a general approach that can be easily integrated in the laboratory routine for carbohydrate analysis. Wear nitrile gloves to avoid contamination of the sample plate during cleaning. Hand-wash the sample plate with 100.0 mL of detergent solution (1.0 mg/mL). Hand-wash the sample plate with distilled-deionized water (DDW). Rinse the sample plate surface with 30.0 mL of MeOH. Put the sample plate in a 600 mL beaker and fill with DDW until the sample plate is fully immersed in water. Put the beaker in an ultrasonic bath (see Table of Materials) and sonicate the sample plate for 15 min (200 W, 40 kHz). Take out the sample plate and blow off water drops using pressurized nitrogen. Deposit 0.2 µL of MeOH on the sample plate to check whether MeOH spreads to other spots. Note: If MeOH merges with other spots, repeat steps 1.1.3-1.1.5; if not, proceed to the next step. Purge the drying chamber by room temperature nitrogen at a constant flow rate to maintain a low relative humidity environment. Keep the sample plate temperature constant at regular- (25 °C) or fast-drying conditions (50 °C), regulated by a temperature-controlled copper block in the drying chamber. Dissolve DHB in 50% acetonitrile (ACN):50% DDW to prepare a 0.1 M solution. Dissolve SLeA in DDW to prepare a 10-4 M solution. Dissolve MH in DDW to prepare a 10-4 M solution. Note: The optimized procedures for analyzing small and regular amounts of samples are described here. Ensure that the sample plate temperature is stabilized at the desired temperature before depositing the solutions. If the sample spreads over a large area to cover other sample spots during recrystallization, prepare a new sample or repeat step 1.1. Note: The following steps have been developed for minimizing sample and time consumption. It is suitable for quantitative analysis of real samples with a limited amount or quick IMS for quantification analysis. Premix 0.25 µL of DHB solution and 0.25 µL of SLeA or MH solution in a microcentrifuge tube. Vortex the mixed solution using a vortex mixer for 3 s.
Spin down the mixed solution in a mini centrifuge for 2 s (2000 x g). Use a pipette to draw out 0.1 µL of the premixed solution and immediately deposit it on the sample plate. Note: When depositing a small amount of sample, DO NOT keep the premixed solution in the tip of pipette for over 10 s.
Wait for the sample to dry out. Typical drying times are listed in Table 1. Use a pipette to deposit 0.2 µL of MeOH right onto the dried sample spot. The sample will get wet and dry out immediately. Note: Ensure that the deposition procedure is finished in 3 s to avoid significant evaporation loss of MeOH. Examine the sample using a microscope. If the crystal morphologies are not as expected (see Figure 1 for example of desired results), repeat steps 2.1.1-2.1.6 to prepare a new sample. Wear nitrile gloves and carefully take out the sample plate from the drying chamber. Note: The following steps are developed for maximizing the homogeneity of carbohydrate samples with typically utilized MALDI sample amount. The process is suitable for routine and quantitative analyses. The recrystallization process redistributes samples and matrixes evenly to larger areas. Premix 2.5 µL of DHB solution and 2.5 µL SLeA or MH solution in a microcentrifuge tube. Vortex the premixed solution with a vortex mixer for 5 s.
Use a pipette to draw out 1.0 µL of the premixed solution and immediately deposit it on the sample plate. Note: DO NOT use the remaining premixed solution again after depositing the samples. Use a pipette to deposit 1.5 µL of MeOH right onto the dried sample spot. The sample will get wet and dry out immediately. Note: In cases with high sample plate temperature (50 °C), the recrystallization step should be done within 5 s to minimize evaporation of MeOH in pipette tip. Examine the sample using a microscope. If the crystal morphologies are not as expected (see Figure 1 for example of desired results), repeat steps 2.2.1-2.2.6 to prepare a new sample. Note: The analysis is performed using a commercial time-of-flight mass spectrometer (Table of Materials) equipped with a MALDI ion source. The instrument is operated by specific control software (Table of Materials) with pre-optimized extraction delay and laser energy. Spectra are recorded in linear mode with a mass range of m/z = 0 – 1500. The sample plate potential is ±25 keV and every spectrum averages 10 laser shots. Users should conduct instrument optimization and sample analysis using compatible software and follow instrument manufacturer's instructions. Open the instrument control software (see Table of Materials). Insert the sample plate into the mass spectrometer. Select the pre-optimized data acquisition method in the software. Register the whole sample region for IMS using the imaging software (see Table of Materials). Note: Skip this step if not doing IMS. Start data acquisition in the batch mode of the control software. Plot the ion images using the imaging software after data acquisition is complete. Analyze mass spectra using analysis software (see Table of Materials) if the data is recorded without an ion image. Representative SEM images of SLeA mixed with DHB prepared using DD and recrystallization methods are shown in Figure 1. A typical DHB morphology as prepared by the DD method is large needle-shaped crystals at the rim and fine crystalline structures in the center of sample spots. The typical lengths of such needle-shaped crystals are ~100 µm. After recrystallization by MeOH, the sample has a larger area covered evenly with fine flake-like crystals. The lengths of the "flake" crystals are roughly 20-50 µm. Recrystallized samples provide larger effective surface areas than those produced by conventional DD samples. The IMS results indicate that flake-like crystals usually result in higher carbohydrate signal intensity and a more homogeneous spatial distribution. In conventional DD samples, carbohydrate ion signals are distributed mostly at the periphery of sample spots. Figure 2 shows IMS results of SLeA and MH with and without MeOH recrystallization. After recrystallization, the distribution of SLeA and MH signals match well with the bright-field image of sample spots. Also, all recrystallized carbohydrate samples show significant enhancements in signal intensity over those results obtained from DD samples. Because of higher signal intensity and homogeneity, recrystallization markedly improves data quality in quantitative analysis. Enhancing carbohydrate signal intensity by recrystallization is effective for both positive and negative ion modes. Figure 3 compares the signal intensity of sodiated (positive ion mode) and deprotonated (negative ion mode) carbohydrates of recrystallized samples with respect to that of DD samples. On average, recrystallization of SLeA and MH samples increases sodiated signals by factors of 3.9 and 3.3, respectively. For deprotonated SLeA, ion signal is typically enhanced by a factor of roughly 4.7 after recrystallization. Figure 1. SEM images of SLeA prepared with DHB matrix. The samples are prepared with dried droplet and recrystallization methods. Please click here to view a larger version of this figure. Figure 2. Representative results of image mass spectrometry of SLeA and MH prepared with dried droplet and recrystallization methods. Ion images represent distributions of sodiated or deprotonated analytes. All bright-field and ion images are displayed in the same scale. Please click here to view a larger version of this figure. Figure 3. Carbohydrate signal intensities obtained with different sample preparation methods. Black bars: sodiated SLeA (m/z: 843); red bars: deprotonated SLeA (m/z: 819); blue bars: sodiated MH (m/z: 1175). Error bars represent standard deviations. Please click here to view a larger version of this figure. Sample heterogeneity is a crucial problem in MALDI-MS. DD is the most commonly used sample preparation method, but the resultant crystals are highly heterogeneous. Such samples show poor shot-to-shot and sample-to-sample signal reproducibility. Therefore, searching for "sweet spots" in sample areas during data acquisition is a common procedure in MALDI experiments. Such heterogeneous samples are unsuitable for quantification in routine analyses. In the current study, MALDI sample morphology is optimized by recrystallization. The improvement in carbohydrate signal intensity and data stability by recrystallization is attributed to improved incorporation between carbohydrates and matrixes. Because of the hydrophilic properties of most carbohydrates and matrixes, MeOH can efficiently disintegrate MALDI crystals and carbohydrates. 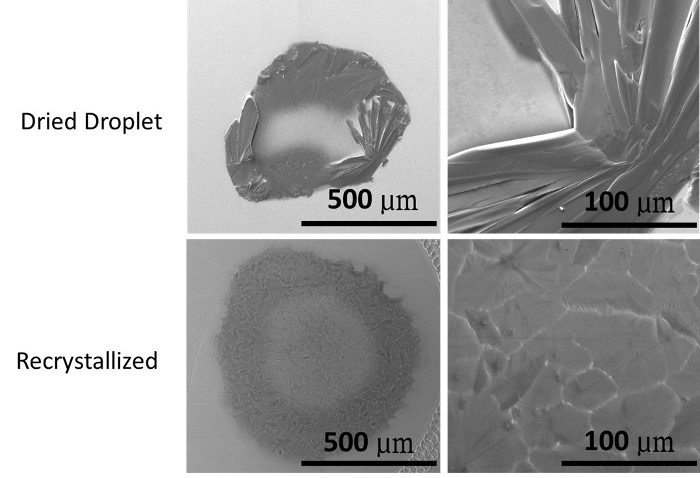 Observation shows that deposition and fast evaporation of MeOH reforms large needle-shaped DHB crystals into small flake-like crystalline structures. This process also minimizes sample segregation and increases surface area. According to IMS data, the reformed crystals provide a better microenvironment for carbohydrate ionization. Notably, utilization of the drying chamber is to provide a reference condition with precisely controlled experimental parameters. For routine analysis, general MS users can follow the protocols under an ambient environment to achieve similar enhancement results. Signal enhancement by recrystallization may also be due to an increase in effective surface area, since MALDI is dominated by surface chemical reactions14,15. The correlation between signal intensity and effective surface area of MALDI crystals has been studied by preparing samples under different sample plate temperatures11,12. 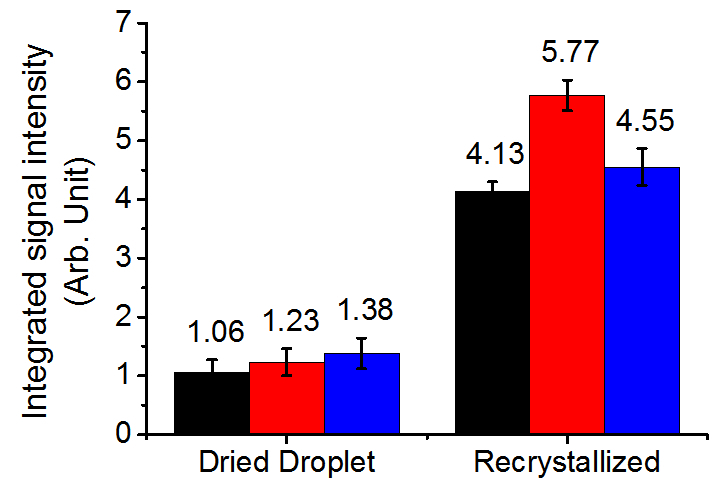 In comparison to a large change in crystal size using the recrystallization method, fine adjustment of crystal size can be achieved by regulating sample plate temperature during the droplet drying process. When using THAP as a matrix, the average size of needle-shaped crystals of THAP reduces 10-fold when sample plate temperature reduces by 40 °C. Observations show that carbohydrate signal intensity increases as crystal size decreases13. However, reducing sample plate temperature is unsuitable for routine analysis because it cannot change the morphology of DHB efficiently and it requires long preparation times. To ensure the best recrystallization result, preparation processes should be performed with care. Firstly, fresh sample mixtures provide the best signal enhancement using the recrystallization method. Once premixed solutions are exposed to the ambient environment, pre-crystallization occurs in the solution, which changes the final crystal size and morphology. Such a morphology change is presumably due to a change in the matrix/analyte ratio. Observations show that recrystallization of such samples cannot provide the best signal enhancement. Therefore, the pipetting procedure should be operated with high efficiency to protect the sample droplet from pre-crystallization within the pipette tip. Secondly, a suitable amount of MeOH should be applied to completely reform samples. During the recrystallization process, MeOH should be deposited to the sample surface as quickly as possible to avoid considerable evaporation loss. MALDI sample crystals do not dissolve completely if the volume of deposited MeOH is not enough. In contrast, a large volume of MeOH will spread out and reduce the samples' density. It is recommended to observe sample morphologies under a microscope to ensure that crystal morphologies are reformed properly before MS analysis. If crystal morphologies are not fully altered (see Figure 1 and Table 1 for reference), it is necessary to prepare a new sample with the same procedures. The best quantitative analysis approach in MALDI-MS is analyzing reformed samples with IMS. Although reformation significantly minimizes sample heterogeneity, the signal intensity of analytes in different areas may still vary (Figure 2). In comparison with manual examination of selected sample positions, analysis of entire sample areas with IMS averages out uncertainties and data variation. Observations show that recrystallization of samples prepared with a regular amount (1.0 µL sample solution) provides superior carbohydrate sample homogeneity in quantitative analysis (step 2.2). However, IMS analysis of such samples consumes more analysis time than the manual examination method. To achieve rapid IMS analysis, preparing samples using 0.1 µL sample solutions (step 2.1) can produce small sample areas and reduce analysis time. Recrystallization of MALDI samples provides superior sample morphology for sensitive and quantitative analysis in MALDI-MS. The basic principle behind this method is clearly demonstrated. The experimental processes developed in this work are convenient and effective for general experimental conditions. These experimental processes can be readily applied to routine analyses without extra cost. Holme, D. J., Peck, H. Analytical Biochemistry. 3rd edn, Addison Wesley Longman Limited. (1998). Costello, C. E. Time, life ... and mass spectrometry - New techniques to address biological questions. Biophysical Chemistry. 68, (1-3), 173-188 (1997). Caroff, M., Karibian, D. Structure of bacterial lipopolysaccharides. Carbohydrate Research. 338, (23), 2431-2447 (2003). Marvin, L. F., Roberts, M. A., Fay, L. B. Matrix-assisted laser desorption/ionization time-of-flight mass spectrometry in clinical chemistry. Clinica Chimica Acta. 337, (1), 11-21 (2003). Harvey, D. J. Matrix-assisted laser desorption/ionization mass spectrometry of carbohydrates. Mass Spectrometry Reviews. 18, (6), 349-450 (1999). Ciucanu, I., Kerek, F. A simple and rapid method for the permethylation of carbohydrates. Carbohydrate Research. 131, (2), 209-217 (1984). Lamari, F. N., Kuhn, R., Karamanos, N. K. Derivatization of carbohydrates for chromatographic, electrophoretic and mass spectrometric structure analysis. Journal of Chromatography B. 793, (1), 15-36 (2003). Nishikaze, T., Amano, J. Reverse thin layer method for enhanced ion yield of oligosaccharides in matrix-assisted laser desorption/ionization. Rapid Communications in Mass Spectrometry. 23, (23), 3787-3794 (2009). Williams, T. I., Saggese, D. A., Wilcox, R. J., Martin, J. D., Muddiman, D. C. Effect of matrix crystal structure on ion abundance of carbohydrates by matrix-assisted laser desorption/ionization Fourier transform ion cyclotron resonance mass spectrometry. Rapid Communications in Mass Spectrometry. 21, (5), 807-811 (2007). Nicola, A. J., Gusev, A. I., Proctor, A., Jackson, E. K., Hercules, D. M. Application of the fast-evaporation sample preparation method for improving quantification of angiotensin II by matrix-assisted laser desorption/ionization. Rapid Communications in Mass Spectrometry. 9, (12), 1164-1171 (1995). Lai, Y. H., et al. Reducing Spatial Heterogeneity of MALDI Samples with Marangoni Flows During Sample Preparation. Journal of the American Society for Mass Spectrometry. 27, (8), 1314-1321 (2016). Ou, Y. -M., et al. Preparation of Homogeneous MALDI Samples for Quantitative Applications. Journal of Visualized Experiments. (116), e54409 (2016). Lee, H., et al. Enhancing carbohydrate ion yield by controlling crystalline structures in matrix-assisted laser desorption/ionization mass spectrometry. Analytica Chimica Acta. 49-55 (2017). Allwood, D. A., Perera, I. K., Perkins, J., Dyer, P. E., Oldershaw, G. A. Preparation of 'near' homogeneous samples for the analysis of matrix-assisted laser desorption/ionisation processes. Applied Surface Science. 103, (3), 231-244 (1996). Sadeghi, M., Vertes, A. Crystallite size dependence of volatilization in matrix-assisted laser desorption ionization. Applied Surface Science. 127, (Supplement C), 226-234 (1998).